Click the button below to add the METALO - Stainless Steel Cleaner & Polish to your wish list. 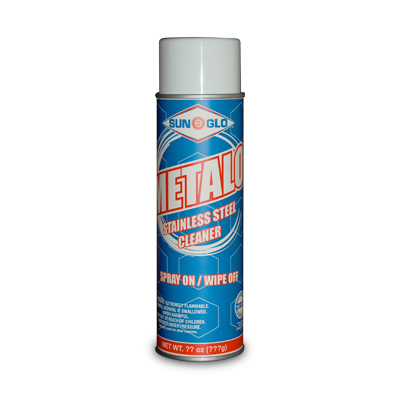 Sun-Glo® METALO Stainless Steel Cleaner & Polish is the #1-rated product for stainless steel care on the market. Specially formulated for stainless steel surfaces, Sun-Glo Stainless Steel Cleaner & Polish is excellent for removing dirt, residue, fingerprints, water spots and whatever other markings you notice on your stainless steel. It provides a brilliant, streak-free shine without any hard rubbing. In addition to cleaning and polishing, Sun-Glo Stainless Steel Cleaner & Polish protects stainless steel by leaving a shiny, protective barrier that resists fingerprints and repels dust and dirt. Oil based formula. Use on any shiny metallic surface including aluminum, chrome and copper.